To all the clubs that took advantage of ordering TRU Touch Judge shirts, they are in the mail and will be arriving shortly. Please note that while these are not required this year, they more than likely will be in the future. 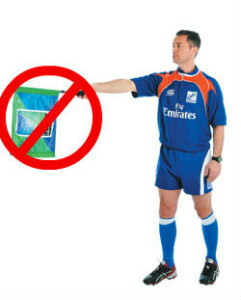 However, having home team designated and certified touch judges is a requirement for all league matches. We recommend when confirming with the assigned referee that you go ahead and let them know who will be running the touch lines. Touch – Mark where the ball goes in to touch by raising your flag. Ball side TJ – Stand at previously made mark with flag raised and opposite arm pointing towards throwing team. Far side TJ – Mark 10 meters from the lineout mark for the defensive team. Kicks at goal – TJs stand behind posts (one near, one far). TJs confirm with each other before raising flag if converted. TJs need not signal if conversion is no good. Kickoffs – Mark 10 meters for the receiving team. Scrums – Mark 5 meters from the back foot of the scrum. Penalties – Mark 10 meters for the defensive team. NOTE: Do not indicate the offside line by holding the flag straight out. This action indicates foul play to the center referee. If you need to adjust player positioning, use your non-flag carrying arm to motion them back. Score & Time Keeping – While not required, this is often very helpful to the center referee. You may note that the above responsibilities don’t include signaling knock-ons, indicating penalties or foul play. 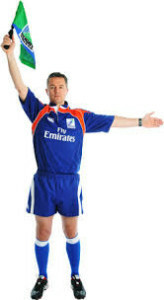 These are responsibilities of certified Assistant Referees which require USA Rugby courses.